The new generation of save cooling technology by GLOBAL ICE TEC AG assures, that even with patchy energy supply reliable cooling will be guaranteed for at least three days. This technology provides the basis for substantially improving the living conditions in developing and emerging countries – even without constant power supply. This patented technology is extremely robust, low-maintenance and produces no emissions in daily use. The new generation of save cooling of a UNOCOOL® 165 refrigerator requires up to 30 % less energy compared to the usual appliances. Depending on the outside temperature the inside temperature can be kept for several days below + 8 degree Celsius. The new generation of save cooling is ideal for usage in countries with instable or patchy energy supply and can even be fully energy self-sufficient if combined with a single solar module. SO EASY, SO INGENIOUS. With Solar Module 100 % Energy Self-Sufficiency is achieved. 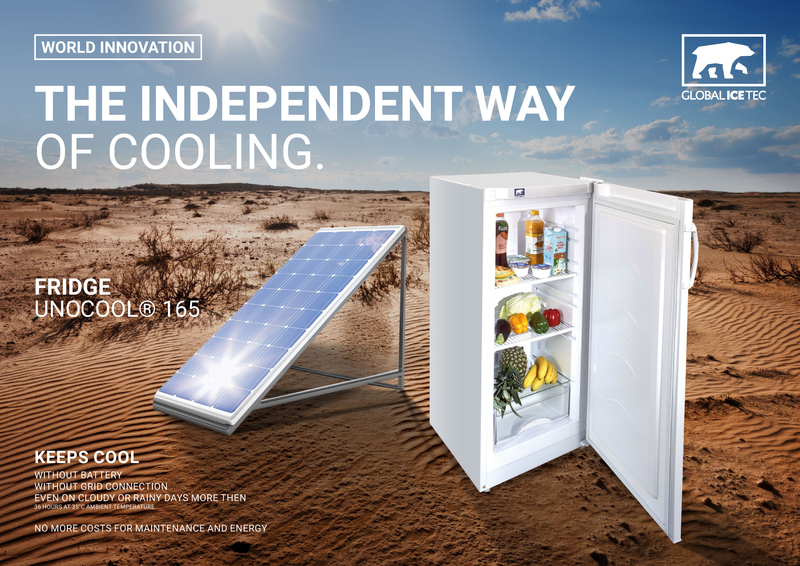 1 Standard solar panel = self-sufficient energy for 1 UNOCOOL® 165 refrigerator. No dehumidification of interior as is the case with conventional cooling technology. Contents therefore stay fresh even without additional wrappings. 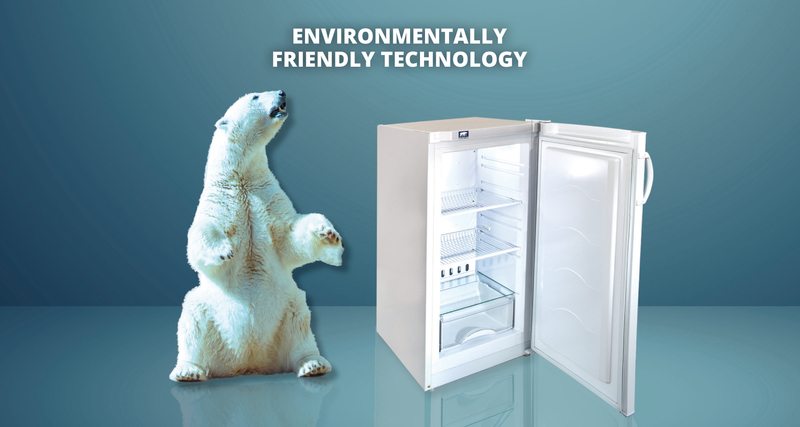 The UNOCOOL® 165 utilizes an absolutely non-toxic and environmentally friendly refrigerating agent. We are not liable for the content of external links. The information made available on this website has been carefully checked and is regularly updated. No liability for the correctness and completeness of the information is accepted. In no case are we liable for any consequential damage direct, indirect, and special or other damage caused through the use of this website or external links that can be reached from this site. The complete contents of this website are subject to the copyright of GLOBAL ICE TEC AG. All rights reserved. Every form of reproduction of parts or of the complete contents of this website, as well as their duplication or transmission to third parties, is allowed only with the written authorization of GLOBAL ICE TEC AG.